Frank Haith's Tigers made good use of their passing game and their big men to get the win Saturday. COLUMBIA, Mo. — South Carolina came to Mizzou Arena on Saturday afternoon winless on the road, winless in the SEC and with a roster full of freshmen. And the Missouri Tigers did just what they were supposed to do. They ran out to an 11-0 lead, stretched it to 20 late in the first half and held off Brenton Williams in the second half to score an 82-74 victory that evened their conference record at 3-3. The number that most pleased Missouri coach Frank Haith was 18. That was the number of assists by the Tigers, and it was their season high. Missouri came into the game last in the SEC with an average of 10.3 assists a game. In their two previous games, the Tigers had totaled 11. We came out sharing the basketball. That’s something we can build on. While certainly there were possessions when the Tigers made an extra pass and found an open shooter, there was another, perhaps more telling, reason for the increased assists. When the Tigers passed to their big men, their big men made the basket. Pass all you want but you don’t get an assist unless the pass catcher converts. Sophomore forward Ryan Rosburg made 4 of 5 shots and all four came off a feed by Brown or Clarkson. The sophomore from Chesterfield even threw down a two-handed dunk after a behind-the-back dish from Clarkson, providing the season-high crowd of 12,033 with its top highlight. Of the three shots in four attempts that freshman Johnathan Williams III made, one came off a Clarkson pass and the other two came after chasing down offensive rebounds. "J3 and Ryan Rosburg were great, 16 points and 7 rebounds (combined)," Haith said. "We will take that most nights." Watch ‘This Week in Mizzou Basketball’ at 6 p.m. Fridays on FOX Sports Midwest. Check your local TV listings. Haith added he would like to see a few more rebounds, but after Williams and Rosburg went 3 for 10 against LSU, he’s not going to nitpick. Against South Carolina, they hesitated less after getting the ball inside and, as a result, were able take it stronger to the rim. For Missouri to be successful, this needs to become the norm. As proficient as Brown and Clarkson are driving to the basket, they know they will see more than one defender coming at them. "Teams are going to converge on us when we’re driving, so we have to make the plays to the big guys and they have to finish," Clarkson said. "They did a good job of that today." One reason Missouri didn’t get much out of its other bigs was because they weren’t on the floor for long. Tony Criswell, who has seemed to have a foot in the doghouse all year, did not see any action until midway into the second half. Shooting 1 for 6 against LSU might have had something to do with his limited minutes. "Coach’s decision," Haith said. "Playing guys that I think can give us a chance to win." Junior college transfer Keanau Post played eight minutes and did not shoot other than attempting a last-second tip off an inbounds pass and freshman Torren Jones was in for less than a minute. After managing only seven assists in Tuesday’s loss at LSU, Haith focused this week’s video sessions on sharing the basketball. The problem, however, isn’t that the Tigers are selfish ball hogs. "It’s not just the passer’s willingness to pass. 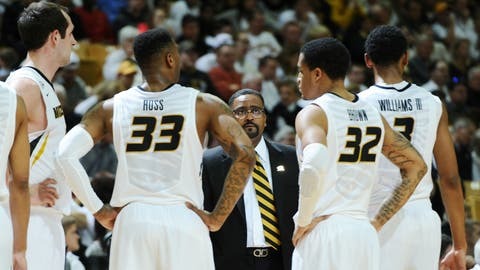 It’s also the guys moving without the ball," Haith said. "We were showing them on film where they become watchers. I want to get them some lounge chairs so they can watch what’s going on. They have to continue to move and call for the ball. I saw a bunch of that today. We still had some plays that we could have made, but even with that said, we were so much better than we have been." Considering who they face in their next three games, the Tigers will have to be even better. On Tuesday, they go to Arkansas for 40 minutes against the Razorbacks’ notorious full-court pressure, and the Tigers didn’t exactly thrive against South Carolina’s press. Then come Kentucky and its high-flying talent to Mizzou Arena on Feb. 1, followed by a visit to conference leader Florida on Feb. 4. To succeed in that stretch figures to take a lot more than good passing. You can follow Stan McNeal on Twitter @stanmcneal or email him at stanmcneal@gmail.com.